"How to Sign Up for a Free/Standard Account"
This is the account creation page. As it says at the top of the page here, only people which wish to add any classifieds, adlinks or web sites into our directory need to create accounts with us. To view all inventories or ads on our site, you can do that all without creating an account. This is the Customer Agreement or Terms of Service statement. 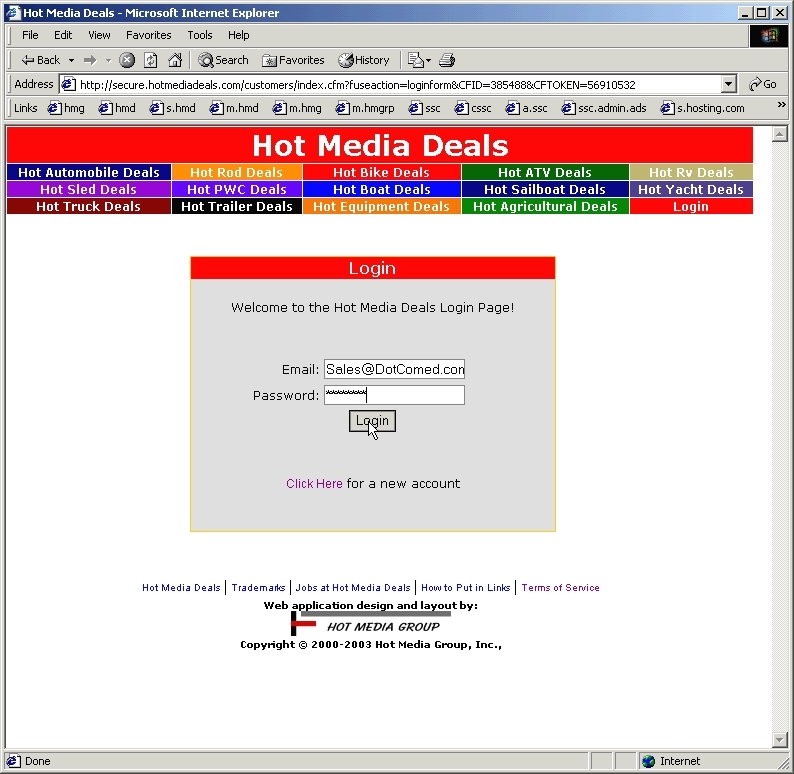 This document outlines all services rendered by Hot Media Deals. After reading it, you can close it and click the checkbox that says you've read and agree to our Terms of Service. All text fields with a "*" next to them are required pieces of information. When all required pieces of information are given, you may click on the "Create New Account" button to submit your account information. For those who might think about submitting false information about themselves to create a fake account, we track and record your exact computer IP address upon creation of your account. This is essentially a warning message notifying you of such practices. 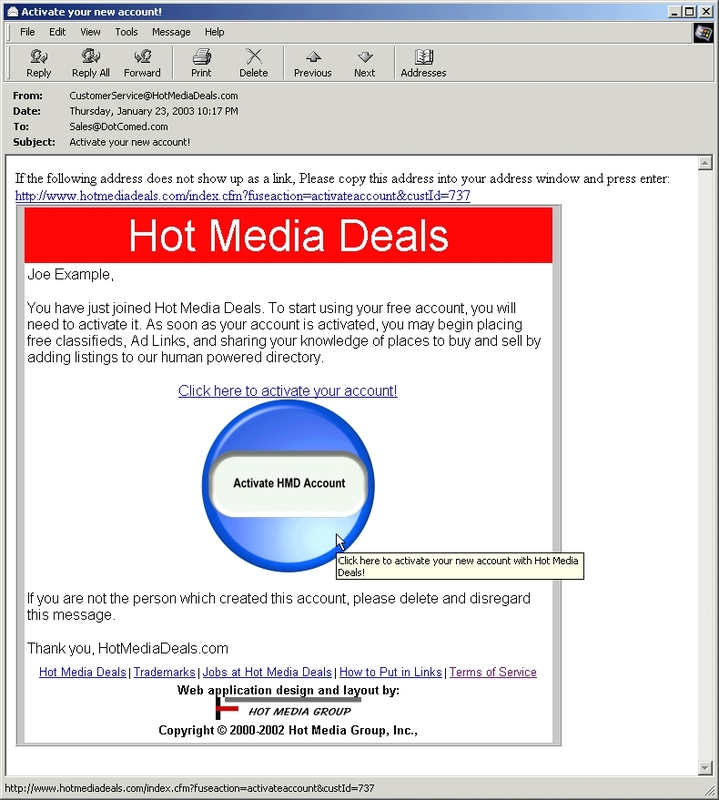 When your account has been sucessfully created, an email message looking like the one in step 6 will be sent to the email account which was used to create your account with. This is done to verify that you are who you say you are. Be sure that you can in fact recieve messages and that your account is not above it's quoted storage space with your provider. This is what the account activation message looks like. To activate your account, simply click on the round blue button and your browser will open a window with the contents of step 7 in it. 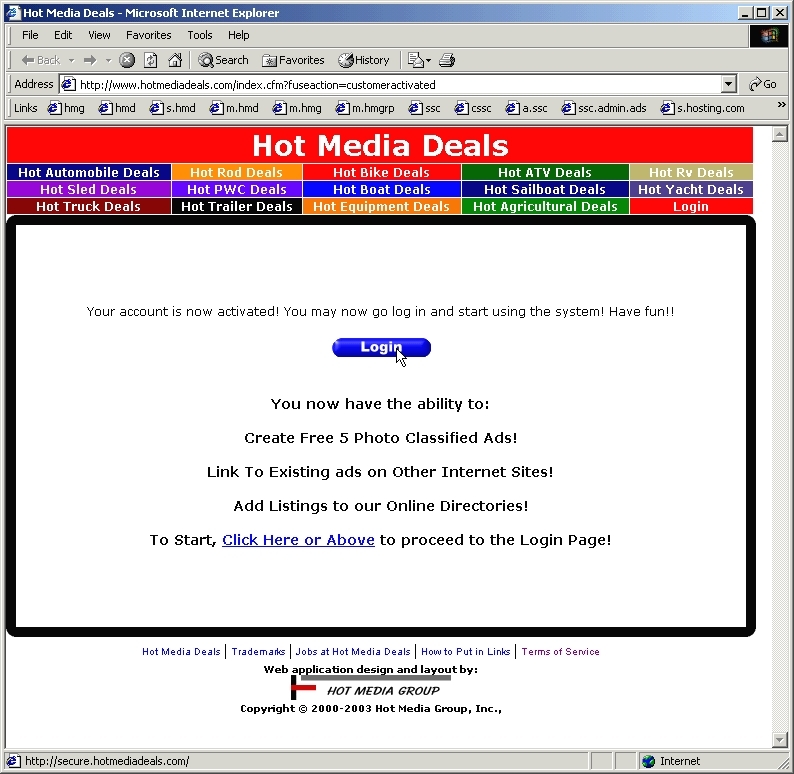 This is the account activated page. If you can see this page after clicking on the activate account link, then you are ready to login. Click on the blue "Login" link/button to get to the Login page. Enter the e-mail address you used to create and activatte your account with. Enter the password which you had entered/used in the account creation process. Some browsers and operating systems might be able to save your password for you for the next time you log in. If you are using a public terminal, in order to protect your password, you might want to click NO. When you can get to this page, you are finished with the account creation process. You now have the ability to create ads and ad internet sites to our human powered directory! Click here to get started by adding your own free Ad Link or Classifieds Ad! Browse, search, add to our directory and enjoy!